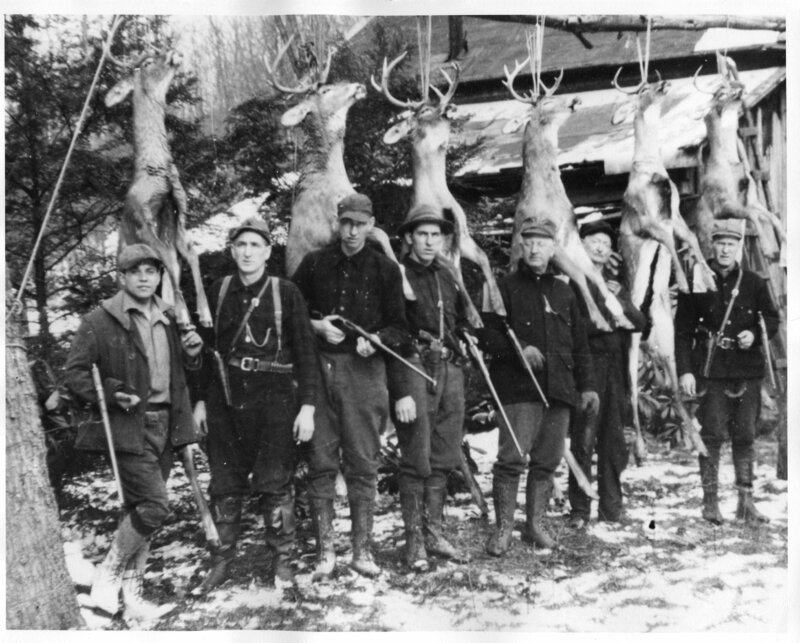 Hunting camps in the mountain country of Elk County defined the lives of the Weeter brothers and the next two Weeter generations. The rail line down the Bennett Branch of the Sinnemahoning River would add an autumn passenger and baggage car in the teens and twenties. Harry would tell of Civil War veterans with white beards seated in the Pullman car with long muzzle loading rifles held straight up between their knees. The younger men had cased Savages and Winchesters and Remingtons stowed with their duffles and gear. The train from DuBois would stop along the line at places named Mix Run, Dents Run, Driftwood and Renovo. Hunters and their gear would head to remote camps on horse drawn wagons. Camps could be tents or tarpaper shacks or farmsteads. Automobiles on paved and unimproved dirt roads soon made for better access in the mountains of Pennsylvania. 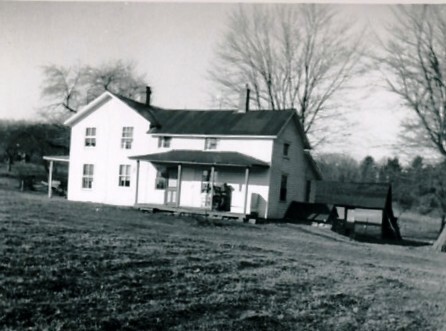 Camp for our families became two 1800's farmsteads northeast of Dents Run. The picture on the left is Barr Camp taken in the 1980's. Except for some paint and a new roof it looks the same as it did at the turn of the century.. The nearest neighbor is the Mix Homestead which is a mile away. In the 1940's the Mix farm was still occupied by a relative of Tom Mix. She was probably in her 90's. My Grandmother (Marge Weeter) would stop and visit with her when she came to camp. It was during one of these visits that she was told that the table they were sitting at in the kitchen was were Tom Mix was born. Our outdoors experiences around Barr Camp and Pine Camp from earliest childhood had much to do with lifelong interests and who we are today. On the right is a picture of Pine Camp that was taken in the early 1950's. 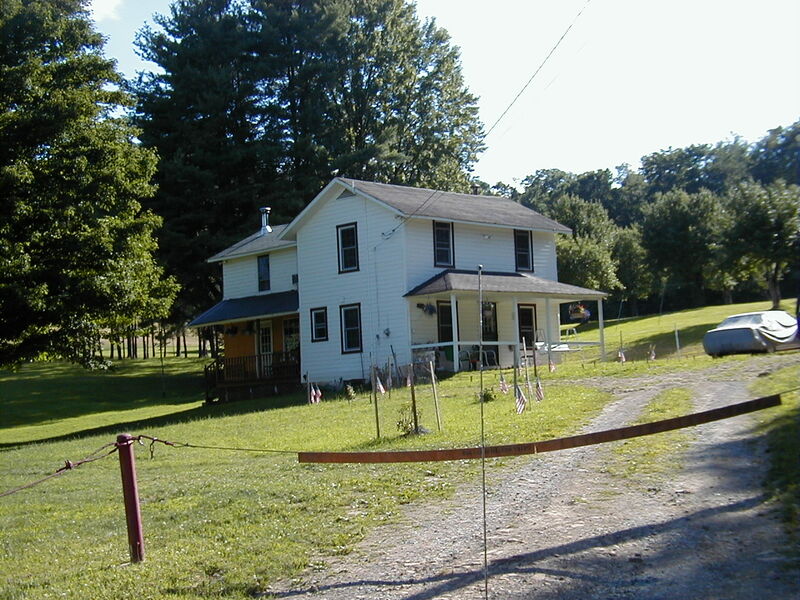 My Grandfather bought this 1870's homestead in the late 40's so his expanding family would have place to visit year round. The main heat for the house was a cast iron cook stove that burned wood or coal. It ran year round - heat in the winter and fresh baked apple pies in the summer. Water was carried from the spring house in two gallon buckets and when nature called the outhouse was only 50 feet away. When the sun started to set the oil lamps would be lit. An Aladdin lantern hung over the dining room table which provided a great light to read by. It usually had enough kerosene to last for two hours so when it started flickering it was time for bed. Harry was a superb craftsman and woodworker. In the late 1940's he built a self contained house trailer with design features ahead of the time. Winter retirement vacations with their trailer and salt water fishing resulted in Florida seasonal homes for Harry and Marge. Pine Camp restoration projects and Elk County hunting seasons were their summer and fall activities. Harry and Earl Weeter passed away in 1968. Marge Weeter passed away in 1974.